Islamic Global Jihad declared war against America on September 11, 2001, in an attack that killed nearly 3000 Americans in the Twin Towers in Manhattan, the Pentagon in Washington, D.C., and in four hijacked airliners. Had the fourth airliner succeeded in reaching Washington, it might have crashed into the White House or the Capitol with even more loss of life. But, thanks to the brave passengers on the plane, the attack was thwarted and the plane crashed in a field in Pennsylvania. Anyone who has watched videos of ordinary men and women jumping out of the Twin Towers to their deaths will never forget the horror perpetrated by Islamic jihadists on that day. The attack took months of intricate, detailed planning by the terrorists, but our government was simply too inept to prevent it from happening. Meanwhile, Muslims around the world danced in the streets at their great victory over America and their spectacular advance in the war against the West. The goal of the Jihad is to impose the Islamic religion and Sharia law over the entire world, and the attack on 9/11 was just the visible tip of the iceberg in what has been and will be a very long war. For example, there is an Islamic missionary organization active throughout the world in recruiting converts to Islam. It is called Tablighi Jamaat, and according to reliable sources, it is estimated that about 15,000 of its missionaries are active in the United States. It is particularly active among Black Muslims and criminals in our prisons. And so, while American soldiers are fighting and dying in Afghanistan against the jihadist enemy, the enemy is quietly subverting the American homeland with virtually no resistance from the American people. It should be reminded that Islam is a totalitarian, genocidal political movement operating under the guise of a peace-loving religion. It is intolerant of other religions and despises the governing principles of the United States. Islam does not believe in the separation of church and state, as clearly demonstrated by the regime in Iran. Yet President Obama refuses to acknowledge that we are at war against Global Jihad or even radical Islamic terrorism. Terrorism, by the way, is just one of the means the war is being fought against the West. And this Global Jihad is being fought by bombing trains in Madrid, bombing subways and buses in London, bombing a night club in Bali, attempted airplane bombings by the shoe bomber and the Christmas underwear bomber, an attempted bombing in Times Square, the murder of 13 soldiers at Fort Hood by a jihadist in uniform, suicide bombings in Israel, the murder of a cinematographer in Holland, the beheading of an American journalist kidnapped in Pakistan, bombings and massacres in India, Indonesia and Uganda, the killing of Christians and burning of churches in Pakistan, Kenya, and elsewhere. There is no end to the atrocities being committed by jihadists. In the U.S. a Muslim father killed his daughter because she was becoming too Americanized. So it should not take a political genius to figure out why the Muslims want to build a mosque at Ground Zero. They want to commemorate and honor those jihadists who died crashing those planes into the Twin Towers. Where better to honor them than at Ground Zero? And not just an ordinary mosque, but a 13-story, $100-million mosque. The developer of the project is Feisal Abdul Rauf, born in Kuwait of Egyptian parents with a known adherence to Islamic radicalism. Rauf was brought to America at the age of 17 by his parents when his father moved from Malaysia to the U.S. to set up the Islamic Cultural Center in Washington, D.C. Rauf then got a BS in physics at Columbia University. In 1997, Rauf established the American Society for Muslim Advancement (ASMA) with funding from Gloria Steinem’s Ms. Foundation, New York Carnegie Corporation, U.N. Population Fund, Rockefeller Brothers Fund, and Hunt Alternatives Fund. The Ground Zero mosque plan is akin to a project initiated by Rauf's late father in 1965. That year, Muhammad R. Abdul Rauf came to New York to plan the construction of an Islamic Cultural Center that took many years to complete.. He bought prime Manhattan real estate at 96th Street and 3rd Avenue, where a huge mosque was built, with funding from Kuwait, Saudi Arabia, and Libya. The mosque at Ground Zero will contain a community center and will draw thousands of Muslims to worship at the very site where 3,000 innocent men and women were murdered by their brave, dedicated jihadist martyrs. It will have a swimming pool and a basketball court to attract the young, an auditorium and culinary school, a library, art studios, and meditation rooms. But it will still symbolize not only a glorious Islamic victory, but also the impending surrender of America to Islam. It will also have a “memorial” dedicated to the victims of the 9/11 attacks, which makes the project even more odious, hypocritical, and dangerous. After all, it will be easy enough to claim the perpetrators of the crime as “victims” of an unjust West. 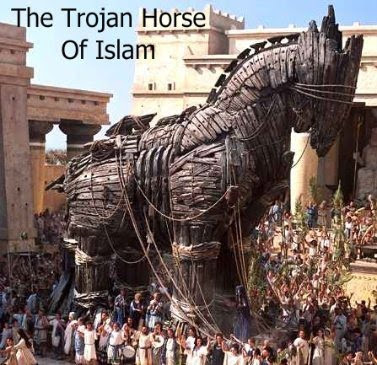 That Americans are willing to permit this Trojan Horse to be built in what is now considered hallowed ground, where so many men and women lost their lives in the worst terrorist attack visited on America, should make us realize how weakened America has become in this life and death struggle under the Obama regime in Washington. Liberals like Mayor Bloomberg of New York, who seems to live in a fantasy world, use the argument of freedom of religion to approve the construction of the mosque at Ground Zero. They do not accept that we are at war with Global Jihad which is determined to destroy us. Somehow, they are not aware that the U.S. Constitution is not a suicide pact. But maybe Bloomberg believes that that Muslims have a Constitutional right to Islamicize America and destroy our Judeo-Christian heritage in the name of religious freedom. I wonder what he would say if Christians decided to erect a giant cross at Ground Zero or if Jews wanted to erect a giant Star of David or a replica of the Ten Commandments at Ground Zero. There is no doubt that if the mosque is built, Ground Zero will become the center of daily religious and political conflict with competing demonstrations, speakers, pamphlet distributions, and even violence. The resentment against the mosque is so great among ordinary Americans that it may well inspire greater resistance to this blatant Islamic plan to conquer America. Meanwhile, it is hoped that enough New Yorkers rise up against this evil project and kill it before it becomes the focus of hatred and dread, an arrogant, brutal affront to the men and women who died at Ground Zero.